There ought to be at least two markets for this disc of numbers sung by a great tenor who died forty four years ago: the considerable global band of fans of Jussi Björling, and the much larger group of people that inhabit the world of pop classics and, specifically, the sub-genre of the 19th century Italian operatic tenor aria. Björling made an enormous number of recordings and many of these have appeared and reappeared on several different labels. Typical recent recyclings include ASV�s Nessun Dorma and Other Favourites, RCA�s Jussi Björling Rediscovered and EMI Classics� The Very Best of Jussi Björling (note the word "very", implying that there is a great deal of just plain "best" around). So what can justify this recycling from Naxos? Well Naxos can usually be relied upon to produce, in their various "Historical" series, intelligently packaged, representative discs of artists� work. Here we have volume 3 in a series that charts Björling�s recording career more or less chronologically. Volume 1 includes early recordings from aged nineteen (1930) onwards at a time when he sang a varied repertoire in his native Swedish whereas in this volume 3 we hear him coming into his own, and his prime, with the body of work that he mostly settled with � 19th century Italian opera. Having said that, five of the twenty three numbers are not Italian and he sings Bizet, Massenet and Gounod in authentic French. The "Pays merveilleux" aria from L�Africaine, a French grand opera composed by a German, he sings disconcertingly in Italian but does so superbly with thrilling dramatic conviction. Overall it is possible to discern an increasing confidence, security and maturing of voice. Another factor that distinguishes this latest disc is that it does contain, by any standards, a high concentration of very popular Italian arias starting with the inevitable "Your tiny hand is frozen", wonderfully paced up to the high note, followed by the famous "Celeste Aida" with its controlled lyricism, again immaculately paced to the upper notes, immediately followed by "La donna e mobile". The latter has a real swagger to it, more zesty than what I remember of the Caruso 78rpm recording that I used to play on a wind-up gramophone as a child � until I knelt on the record and broke it. 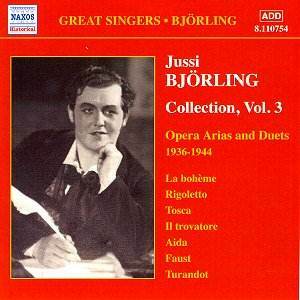 So on the whole, this disc does represent "the best" of Jussi Björling, both in vocal and interpretive terms, and as far as the selections are concerned. It is worth returning to these well known numbers just to hear a voice of great distinction which provides an alternative to that of the great Italian tenor voices of the 20th century with their characteristic indigenous edge, from Caruso to Pavarotti. In Puccini�s "Nessun dorma" there is even a chance to compare Björling with the man who made this aria, thanks to soccer, by far the world�s most famous operatic aria. Those who have assumed that Pavarotti leaves everyone else out of sight in this one may get a shock when they hear Jussi Björling�s recording made 46 years before Pavarotti�s ubiquitous Italian World Cup rendering. I suggested this disc deserves to do well in the pop classic market but there is the drawback of a recorded sound over half a century old. There are two points I would like to make. First, the sound is remarkably good under the circumstances � not over-filtered, so immediacy is maintained. The extraordinary degree of dynamic range in, for example, Massenet�s Manon is not only a tribute to Björling�s vocal control but also to the skills of Naxos�s sound recorder, Stefan Lindstrőm. Second, there is no sense that artist and orchestras are simply going through the studio motions just to fulfil the demands of a lucrative recording contract which is exactly what I felt in the case of a recent recital disc of popular items sung by contemporary tenor pin-up, Roberto Alagna. In comparison Bj�rling sounds excitingly fresh and committed. The disc is enriched by a couple of well known duets from La Bohème and Rigoletto with Hjördis Schymberg, Björling�s long standing operatic, soprano partner.